Visitors to Sudbury's Dynamic Earth can now see what it takes to be in mine rescue. An installation called Ferdeno places people in a virtual underground mine. Those who try the simulator will be asked to perform different tasks and exercises necessary for mine rescue. 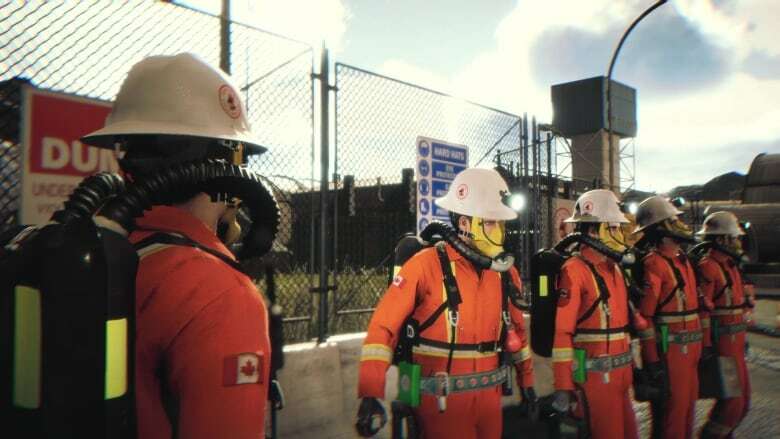 'Federno,' the virtual reality mine rescue software, is on exhibit at Dynamic Earth. (Dynamic Earth/Norcat)Ed Wisniewski, director of software development at NORCAT, said Ferdeno was created for training purposes for those in the mining industry. "What we're looking at doing was creating an environment where we can provide training for dangerous and hazardous scenarios," Wisniewski said, "but yet allow a mine rescue team to go in [and] actually to perform the tasks that they need to do to rescue somebody." Wisniewski says the purpose of Ferdeno is to also help young people understand mine rescue better. The software took four months to create, he said, and those who try the exhibit can learn skills like putting out fires and first aid. The exhibit also has the added benefit of exposing users to a field they may not previously considered. "It shows them that rescue doesn't have to be a policeman or a fireman. There's also mine rescue and it's a big thing, so it also helps us promote a different type of industry."